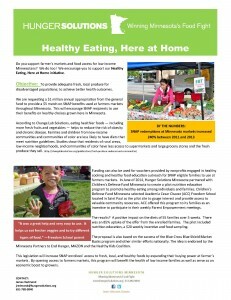 Do you support farmer’s markets and food access for low income Minnesotans? We do too! We encourage you to support our Healthy Eating, Here at Home initiative. Objective: To provide adequate fresh, local produce for disadvantaged populations; to achieve better health outcomes.